The number of people suffering from a variety of vascular and heart ailments is increasing at a rapid pace. Statistics indicate a growth in vascular problems like Aneurysm, Buerger’s Disease, Raynaud’s phenomenon, and Blood clots in veins, Lymphedema, Blood clotting disorders and a lot more. When suffering from any of these diseases, it is recommended to immediately seek Heart & Vascular Treatment in Philadelphia. The treatment imparted by highly experienced and expert doctors can help patients get rid of these problems or control them so as to stop them from getting worse than ever. When suffering from heart and vascular problems, it is imperative to look for a reputed and reliable Cardiovascular Diagnostic Service providers who can check the patient, diagnose the problem and immediately start suitable treatment. One must not take these problems lightly as it can turn out to be fatal. Immediate diagnosis and treatment is the only way to help a person live a healthy life. In some cases, surgery may become the only course of action through which life of a person could be saved. Vascular Surgeons in Philadelphia perform a variety of procedures that include minimally invasive procedures, interventional procedures, and heart surgery. After undergoing a surgery, the patient feels much better. Post-surgery, the patient is expected to take several precautionary measures so as to ensure continued good health. There may be some restrictions on diet and changes in lifestyle. Timely and regular visits to a cardiovascular specialist can also help them stay healthy and safe. Heart and Vascular Care Consultants are board-certified physicians who deliver minimally invasive treatments with less risk, less pain and less recovery time than traditional surgery to treat conditions that impact a person’s quality of life. EVLT is a minimally invasive treatment that uses heat to close off problematic veins and relieve the symptoms they cause. Using imaging guidance (guided by x-ray images), the interventional radiologist threads a thin laser fiber into the problem vein through a tiny needle. Next, the radiologist numbs the length of the vein to minimize discomfort during the heating process. Finally, the laser heat causes the vein to close. Once the problem vein is closed, blood will flow through the remaining healthy veins. This is all accomplished while patients rest comfortably. Return to most normal daily activities is allowed immediately. In endovenous laser ablation (above), an interventional radiologist uses heat to close off problematic veins and relieve symptoms. Radiofrequency ablation is a similar treatment, using a fiber that emits radiofrequency energy instead of heat from a laser fiber. VenaSeal cyanoacrylate: Injects medical glue into the vein to cause closure. Clarivein: Guides a rotating catheter, which is a small, flexible tube, inside the vein to evenly disperse a chemical solution that results in complete closure. Varithena: A foam material is injected into a varicose vein to improve symptoms or appearance. The main advantage of all of these techniques is the avoidance of multiple needle sticks for local anesthesia. There is also decreased risk for potential nerve damage that can occur with burns. 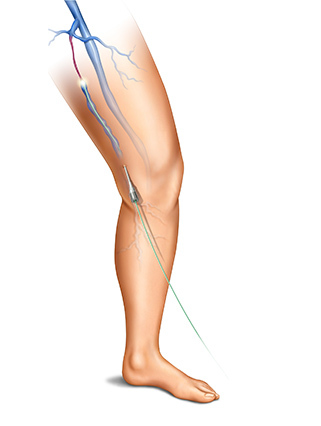 Sclerotherapy is the direct injection of a chemical irritant into a vein to close the vessel. This technique is often used to treat smaller veins such as telangiectasia (spider veins). A variety of materials can be used to irritate the vein lining, which causes them to shrink and close. The solution is administered through a tiny needle. Varicose veins are most often swollen, gnarled veins that most frequently occur in the legs, ankles and feet. They are produced by a condition known as venous insufficiency or venous reflux, in which blood circulating through the lower limbs does not properly return to the heart but instead pools up in the distended veins. More than 25 million Americans suffer from venous reflux disease. The symptoms can include pain and fatigue in the legs, swollen ankles and calves, burning or itching skin, skin discoloration and leg ulcers. In less severe cases, thin, discolored vessels – “spider veins” – may be the only symptom. Gender and age are two primary risk factors in the development of venous reflux. An estimated 72% of American women and 42% of men will experience varicose veins symptoms by the time they reach their sixties. Women who have been pregnant more than once and people who are obese, have a family history of varicose veins or spend a great deal of time standing have an elevated risk for the condition, but it can occur in almost anyone at almost any age. Varicose veins never go away without treatment and frequently progress and worsen over time. Severe varicose veins can have a significant impact on the lives of people who work on their feet, such as nurses, teachers, and flight attendants. Research has shown that more than two million workdays are lost each year in the US, and annual expenditures for treatment total $1.4 billion. Spider veins, also known medically as telangiectasia or venulectasias, are the mildest manifestation of venous insufficiency, similar to varicose veins but smaller. They are small, often tangled groups of tiny blood vessels just under the skin surface that frequently resemble spider webs or tree branches. They are generally red, blue or purple and are clearly visible, usually on the thighs, lower legs and face. Spider veins can sometimes cover large areas of skin, but they are a cosmetic problem only, rarely causing physical symptoms. At least a third of all women and a smaller percentage of men are believed to display the condition. 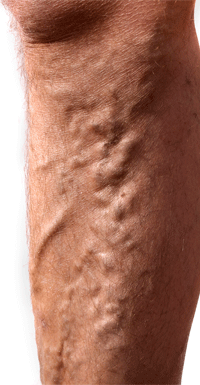 Spider veins are capillaries, thin vessels directly connected with the larger venous system, and like varicose veins they are caused by venous reflux. Spider veins may be isolated or associated with “feeder” veins or with larger underlying varicose veins, but they are not varicose veins – they do not bulge above the skin surface and do not require medical treatment. Spider veins can be diagnosed merely by sight. They tend to take on one of three characteristic patterns – a “sunburst” or spider-web pattern radiating outward from a central point, a “tree-branch” pattern, or a “matting” or linear pattern that may be nothing more than a set of thin lines. Even in the absence of physical discomfort, some physicians observing spider veins prefer to conduct ultrasound exams to determine the extent of the problem and the underlying causes of the condition. Risk factors for spider veins are similar to those for varicose veins – age, heredity, pregnancy, hormonal changes, obesity and extended periods of standing – as well as sun exposure, particularly in fair-skinned people, and injuries to the skin surface. Some physicians believe that exercise, weight loss and the wearing of support hose and flat shoes instead of high heels can reduce the incidence of spider veins. Spider vein treatments are non-invasive or minimally invasive and include sclerotherapy and laser procedures. They are considered cosmetic procedures and are not covered by health insurance or Medicare unless a more serious underlying condition is diagnosed.